Dr. Amy Florian is passionate about promoting health. As a naturopathic doctor (ND), rather than focusing on symptoms, she works to identify the underlying or ‘root’ cause of health issues so that patients can be treated effectively and get better more quickly. She loves to teach and empower her patients to live healthier lives. Dr. Florian grew up in the Annapolis Valley. When she is not seeing patients, you can find her spending as much time as possible outdoors walking and hiking around the beautiful Valley with her husband and two daughters. She loves supporting her local area, so you’ll often find her visiting farmers’ markets, volunteering, and partaking in various community events. 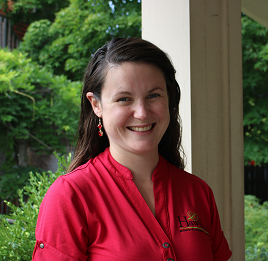 Dr. Florian has a Bachelor of Science from Dalhousie University and a degree in Naturopathic Medicine from the Canadian College of Naturopathic Medicine (CCNM). She holds professional memberships with the Nova Scotia Association of Naturopathic Doctors (NSAND) and the Canadian Association of Naturopathic Doctors (CAND), and is licensed with the College of Naturopathic Doctors of Alberta (CNDA).